Public opinion shapes policy more than you would think—and that’s not always a good thing. 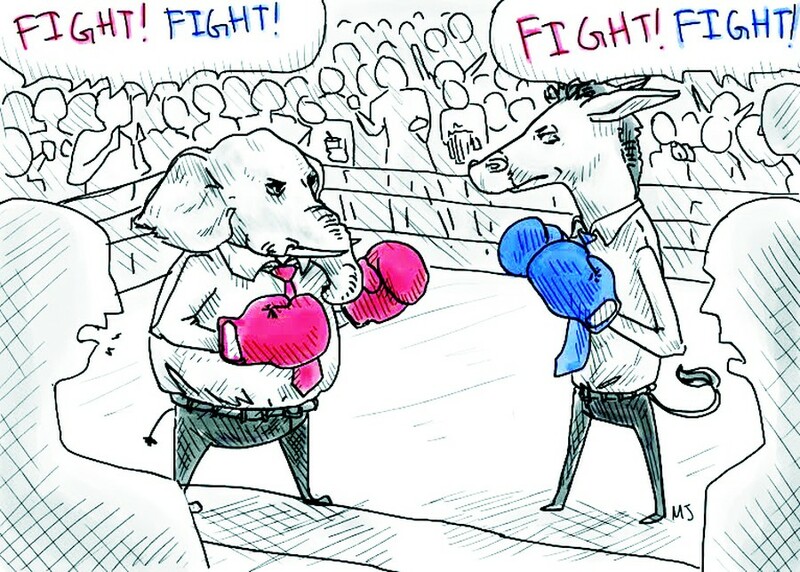 The popular political narrative of this decade depicts a legislative body so encumbered by partisanship that it cannot facilitate national progress or meet the problems facing our nation. This idea is one expressed by both the public and the media. While it is a popular contention, it is not only unfounded, but also wrongly asserts culpability and absolves average voters of their inherent democratic responsibility. Statements that reinforce this notion perpetuate division in modern politics and are more to blame for engendering partisanship than the actions of the politicians themselves. In the end, it’s the loud voices that truly dictate politics and policy. Take, for example, September 30, 2014, when the CDC confirmed the first diagnosis of Ebola in the United States, inciting a national scare. The emergence of this disease within U.S. borders unleashed a torrent of media coverage and public outcry, which escalated with each new diagnosis. At the epicenter of this eruption was an accusatory finger pointed directly at Washington. The media and the public immediately blamed languid policy makers for their lack of foresight and for their votes on dozens of bills that could have assuredly mitigated this plague. Despite the uproar, Ebola would claim only two lives in the United States. To put this in perspective, diabetes, which does not demand 24/7 attention of the news, affects in excess of 29 million Americans, and is estimated to kill over 250,000 Americans every year. Furthermore, in the wake of Ebola’s appearance on U.S. soil, Congress appropriated over five billion dollars to combat and respond to the disease, a number which dramatically dwarfs the federal funding appropriated to prevent and treat diabetes. The response of the public and the media to a disease which, a consensus of health officials agree, did not pose a veritable large-scale threat to public health in the U.S. demonstrates public irrationality amplified by fear. The immediate response from policymakers in Washington speaks to the impact that constituent positions, even irrational ones, have on politicians who can be ousted in a heartbeat. Tepid sentiments are non-sentiments in modern politics and it is often the recalcitrant few—the people calling their Senators, posting on social media, and phoning their local radio stations—that ultimately spur political action. It is thus that the voice of the greater public is drowned out by the incessant booming of the staunch liberals and the unflagging conservatives; it is thus that partisanship and poor governance spreads like a plague across the country. Another instance of mass alarm this past year was caused by a proposed amendment to the landmark 2010 Citizens United bill that would effectively overturn the original ruling that prohibited the government from regulating independent political expenditure. The resulting protest from an enraged public shook the Capital to its core: thousands called, emailed, and faxed their pleas to their politicians, entreating them not to eliminate the First Amendment. On top of this, media hubs on either end of the political spectrum each harangued the opposition, and turmoil ensued. Politicians who once claimed to loathe the impact of money in politics were now vehemently decrying the proposed resolution at the entreaties of their constituency. What was once a clear question of regulating campaign spending transformed into a national quarrel over legal specificities, moral and ethical implications, and our political system as a whole. The misinformed invective of the general public seemed to have crept into the political sphere, poisoning the minds of politicians and forcing them to oblige their foolish constituency. The resolution was not enacted and America responded by lambasting Washington’s ineptitude. Once again the public, acting illogically based upon unfounded fears and overly biased by extreme beliefs, derailed the legislative process and pushed Congress toward even more extreme separation. But, while the public may, at times, be prone to bouts of emotive-naiveté and ineptitude, it may also be characterized by apathy. With respect to Social Security, a number of politicians seek to truncate the number of covered benefits to solve the impending monetary deficiencies, but it is evident that in doing so, necessary care would be denied to many individuals. Contrarily, common sense proposals including rebalancing the two Social Security funds and increasing the maximum percentage of covered wages will not only address the immediate problem, but will also do so without jeopardizing the quality of and the extent to which individuals may receive essential care. The reason the choice doesn’t seem obvious to all is because most people are not paying attention. Social Security is a bedrock of welfare services in the United States, and yet most are entirely apathetic to this debate and may not even know that this issue is immediately pressing. Legislation on this issue has languished in both the Senate and the House for many sessions of Congress, impeded by an unresponsive public and media. Like water, the majority of politicians follow the path of least resistance; they are pawns in the hand of the mob that is their constituency. If the public is indifferent to a cause, a politician has little incentive to pursue it. A government, of, by, and for the people is strongest when those people involve themselves in the process of politics and endeavor to understand and work with others in order to reach effective solutions. The public blames politicians for what it perceives to be systemic failings in politics and the political system. However, it is the public that is largely responsible for the problems that we see in our current political system, and it is up to the public to turn things around.